Ever wanted to play tennis at Wimbledon? To kick a ball around Wembley? Well the truth is that you can’t. These hallowed places are the domain of the elite few. 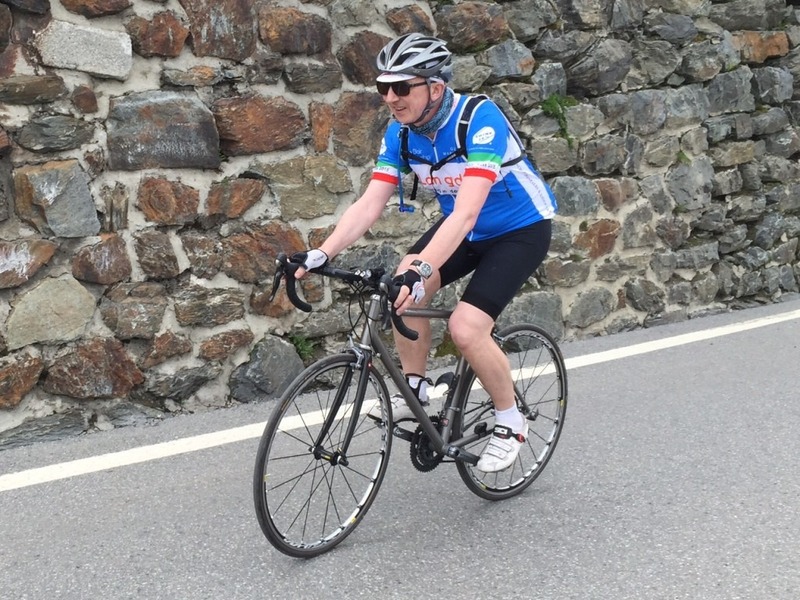 Yet one of the thing that makes cycling so special is that whether you are Chris Froome – or like me, a very middle aged man in lycra (MAMIL) – you can choose your fantasy dream cycling challenge and with a bit of planning it’s yours! The Stelvio Pass in the Italian Dolomites was my dream destination this past June. Why Stelvio? – in truth, when I started planning, all I knew about it was that Clarkson et al raved about the route on ‘Top Gear’ and described it as the finest driving road in Europe. Once I began to research it in more detail I found that it has featured in 4 Giro D’Italia since 1960 and has a cycling pedigree that ranks with the great climbs like Mt Ventoux, Alpe D’huez and the Col du Tourmalet. The Stelvio Pass (or Passo dello Stelvio in Italian) is the second highest road pass in the Alps and misses out being the highest by just 13 metres. The climb from Prato is 24 km long and features 48 hairpin bends. You start in the valley and climb 1808 metres in altitude. For those who like statistics the average gradient is 7.4% (in local terms it’s like cycling from Northwood up the ‘Col de Mount Vernon’ about 100 times). If you have always wanted to tackle a classic climb but have never quite had the confidence, here are some tips from a 58 year old MAMIL . Tip 1 – Don’t read up too much in advance! In my experience the more you read, the more scared you will get and definitely don’t watch any YouTube videos. These videos always feature cyclists who are 25 years younger, who never get out of breath and who never seem to stop to eat cake. Tip 2 – Don’t rush it – pace yourself. 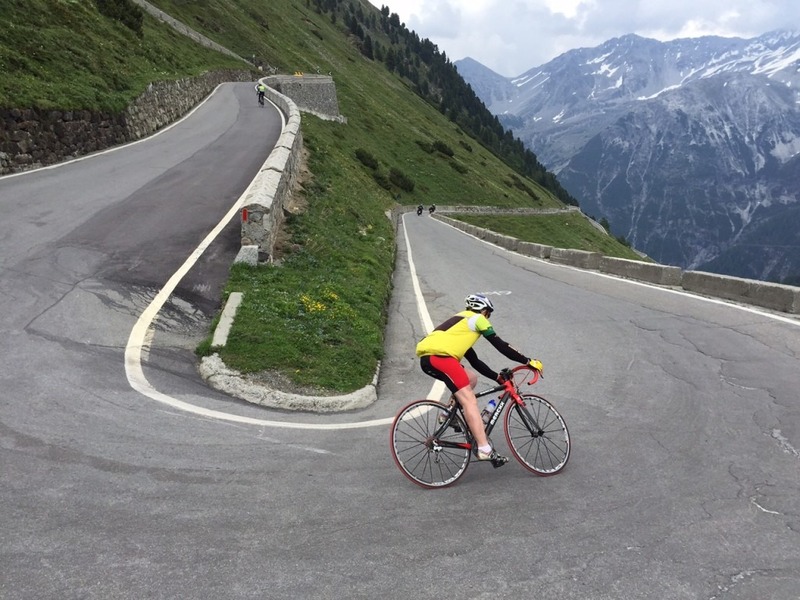 A climb like Stelvio is achievable by most cyclists who have done 6 – 9 months advance training. (more about that later). You’ll soon discover that there is no hiding place on Stelvio and that any mental or physical weaknesses will be exposed. This is aggravated if you go off too fast or try to keep up with a friend who is a stronger cyclist. Narrow differences between cyclists at home are magnified. Cycle at your own pace – you’ll be on the hill for between 3 – 5 hours so you need to conserve your energy. Tip 3 – Training – Don’t cut corners People ask me “how can you train to cycle uphill for 28 kilometers – surely there is nothing like that in Hertfordshire or Middlesex?” The truth is that you can’t and I certainly wouldn’t recommend “everesting” Batchworth Hill for practice. My own training schedule comprised of weekly cycling (about 45 – 50 miles on Sunday mornings all year round (yes – including winter) and 30 minutes a day on a cross-trainer at home. I think good aerobic fitness counts for a lot, especially as the air begins to noticeably thin above 2,250 meters, just when you think the climb will never end. Tip 4 – Lose weight – They say that to be a great cyclist you need to do three things – lose weight, lose weight and lose weight. The easiest way to lose weight is to trade your clunky road bike for an ultra-lite carbon job. It’s true, a lightweight bike will make a huge difference especially if you combine your investment with losing a stone in weight. After all, an extra 14lbs of body weight is like carrying 6 x 1 kg bags of sugar in a rucksack. 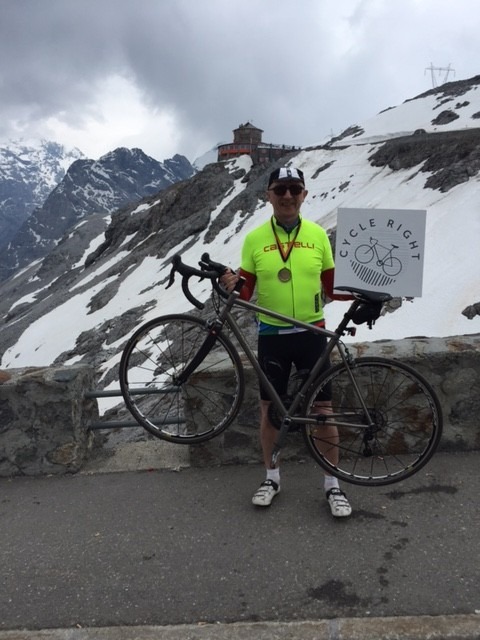 Tip 5 – Get your gearing checked out – Stelvio was my third big climb and each time I have made it less difficult for myself by changing my rear cassette for something more forgiving. Last year’s ride up Mt Ventoux in France wouldn’t have been possible without a Shimano Ultegra 12 – 30 cassette (That’s the number of teeth on the cogs on the back wheel – for the non technical.). I’ve been wishing all year that Shimano would hear my cry and build an 11 – 32 cassette just for me. 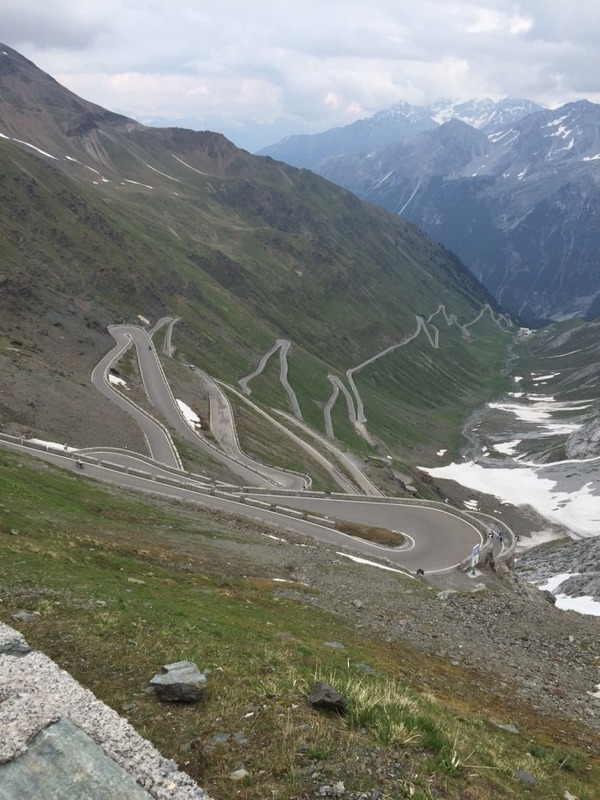 I was going to need all the help I could get on Stelvio’s 48 hairpin bends! Alas no such luck. I was just thinking that I’m stuck when at Cycle Right they told me that I could combine a SRAM 11 – 32 cassette with my Ultegra 10 – speed triple and give me the ultimate combination of speed on the flat and easier climbing on the way up. I was thrilled! – The difference those two extra teeth made was amazing. Tip 6 – don’t forget the descents – Going downhill has never been something I’ve found easy. My fear goes back to an accident that I had with a mad French mountain biking instructor on the top of a mountain in the French Alps. He said “follow me” – which I did for the first 50 meters until I hit gravel, lost control and went over the handlebars. I’ve since discovered that my fear of descending is all too common and has nothing to do with cycling ability going uphill. I have to thank Cycle Right for suggesting that they fit me a pair of Swiss Stops for me. These lovely little blue brake blocks had a transformational effect on my confidence. It’s hard to believe that such a small investment could do so much. I felt safer and far more confident. The breaking effect was progressive and without the slightest hint of a squeal in all weather conditions. I can honestly say that I enjoyed every hairpin bend and tunnel of the one hour long – 20 kilometer descent from Stelvio into Bormio. So how did I get on? Well I’m proud to say that I climbed Stelvio in just under 5 hours. The average is about 3 hours so you can imagine how pleased my fellow cyclists waited were to see me coming up in the last group. Some of them has been hanging around for about 2 hours and had enjoyed lunch and done a bit of souvenir shopping in the meantime. It was getting pretty cold at the top of the Col, which is above the snow line most of the year. I felt really proud of my achievement and thrilled to be cheered in. I cannot thank the team at Cycle Right enough for getting me and my bike so well prepared. Where next? – Our plan next year is to climb the Col du Tourmalet in the Pyrenees. I can’t wait to add another classic climb to my cycling roll of honour. My final tip: if you haven’t done a classic climb be reassured that if I can do it, so can you! Enjoy your cycling! Howard Morgan lives in Northwood and has a consulting business based in Pinner. He took part in the 5 day Langdon Charity Cycle Challenge 2015 with ground support by tour company, Saddle Skedaddle. The 35 strong Group raised the net amount of £85,000 for young people with learning disabilities. Howard Morgan is also a regular visitor and supporter of his local cycle shop, Cycle Right, a plaque of which you can see him holding in his photos attached. Feeling inspired? For more information about our bespoke rides, CLICK HERE.